Recently in March 2019, the Dalai Lama has spoken out about his successor post his death is likely to be his reincarnation in India. He also warned that any Chinese interference in succession should not be considered valid. 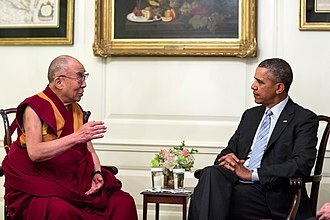 ^ "The Dalai Lama and China". NBC News. Retrieved 29 June 2017. ^ "Column: Home of the Dalai Lama". currentincarmel.com. Retrieved 29 June 2017. ^ "UCSD Chinese Should Welcome Dalai Lama—Not Parrot Party Line – Times of San Diego". Tibet Office. Retrieved 29 June 2017. 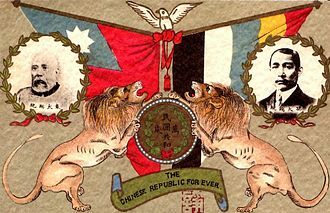 ^ "Tibet: The End of Serfdom Part1". 2016. 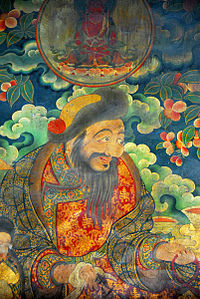 Gendün Druppa was considered posthumously to be the 1st Dalai Lama. Gendün Druppa was born in a cowshed in Gyurmey Rupa near Sakya in the Tsang region of central Tibet and he was raised as a shepherd until the age of seven. His birth name was Péma Dorje, he was placed in Narthang Monastery. In 1405, he took his vows from the abbot of Narthang. When he was 20 years old, in about 1411, he received the name Gendün Druppa upon taking the vows of a bhikṣu from the abbot of Narthang Monastery. Also at this age he became a student of the scholar and reformer Je Tsongkhapa, around this time he became the first abbot of Ganden Monastery, founded by Tsongkhapa himself in 1409. By the middle of his life, Gendün Druppa had become one of the most esteemed scholar-saints in the country, since the time of Gendün Gyatso, who formalized the system, monks have gone to the lake to meditate when seeking visions with guidance on finding the next reincarnation. 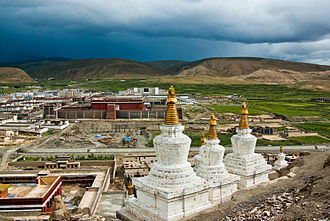 Gendün Druppa founded the monastery of Tashilhunpo at Shigatse, which became the seat of the Panchen Lamas. This articles concerns the Sakya school of Tibetan Buddhism. For information on the ancient Śākya tribe, see Shakya, the Sakya school is one of four major schools of Tibetan Buddhism, the others being the Nyingma and Gelug. 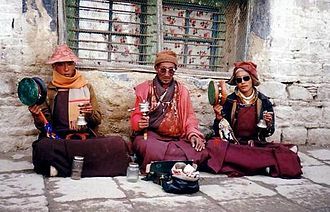 It is one of the Red Hat sects along with the Nyingma, the Sakya tradition developed during the second period of translation of Buddhist scripture from Sanskrit into Tibetan in the late 11th century. 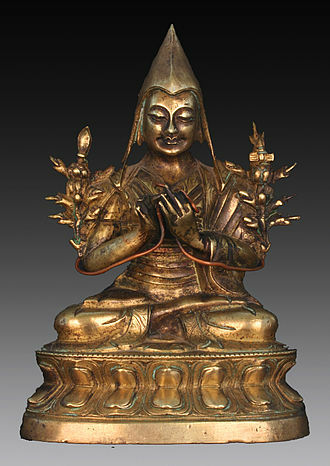 Konchog Gyalpo became Drogmis disciple on the advice of his elder brother, from Drokmi comes the supreme teaching of Sakya, the system of Lamdre Path and its Fruit deriving from the mahasiddha Virupa based upon the Hevajra Tantra. Mal Lotsawa introduced to Sakya the esoteric Vajrayogini lineage known as Naro Khachoma, from Bari Lotsawa came innumerable tantric practices, foremost of which was the cycle of practices known as the One Hundred Sadhanas. Other key transmissions that form part of the Sakya spiritual curriculum include the cycles of Vajrakilaya, Mahākāla and Guhyasamāja tantras. The main Dharma system of the Sakya school is the Path with its Result, the other major system of the Sakya school is the Naropa Explanation For Disciples. In due course, two subsects emerged from the main Sakya lineage, founded in Tsang by Ngorchen Kunga Zangpo, the Ngor school is centered on Ngor Evam Choden monastery. It represents 85% of the Sakyapa school and most if not all the monasteries in India are Ngorpa, founded by Tsarchen Losal Gyamtso. 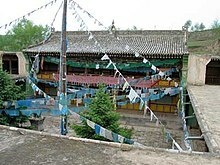 Nalendra became the home of the whispered-lineage of the Tsar school, the Bodongpa tradition, founded by Bodong Panchen Chögle Namgyel, is considered by some scholars to be a sub-sect of the Sakya tradition. 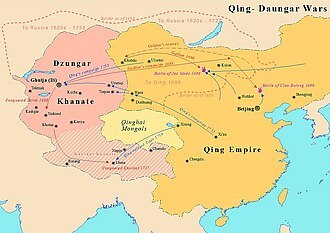 The Mongol conquest of Tibet began after the foundation of the Mongol Empire in the early 13th century, in 1264, the feudal reign over Tibet was given to Drogön Chögyal Phagpa by Kublai Khan, founder of the Yuan dynasty. 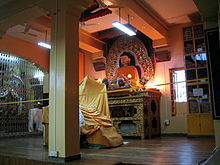 The leaders of the Sakya regime were as follows, Drogön Chögyal Phagpa 1253-1280 Dharmapala Raksita 1280-1282, d. The present Sakya Trizin, Ngawang Kunga Tegchen Palbar Trinley Samphel Wanggi Gyalpo, today, he resides in Rajpur, India along with his wife, Gyalyum Kushok Tashi Lhakyi, and two sons Ratna Vajra Rinpoche and Gyana Vajra Rinpoche. 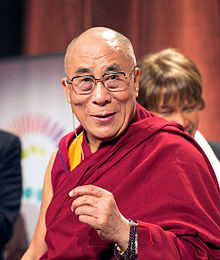 The 14th Dalai Lama (/ˈdɑːlaɪ ˈlɑːmə/, /ˌdælaɪ ˈlɑːmə/, is the current Dalai Lama. Dalai Lamas are important monks of the Gelug school, the newest school of Tibetan Buddhism which is headed by the Ganden Tripas. From the time of the 5th Dalai Lama to 1959, the government of Tibet. 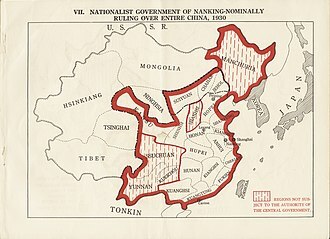 The Gelug schools government administered an area corresponding to the Tibet Autonomous Region just as the nascent PRC wished to assert central control over it. During the 1959 Tibetan uprising, the Dalai Lama fled to India, the 14th Dalai Lama received the Nobel Peace Prize in 1989. His family was of Monguor extraction and his mother, Diki Tsering, gave birth to him on a straw mat in the cowshed behind the house. He was one of seven siblings to survive childhood, the eldest was his sister Tsering Dolma, eighteen years his senior. His eldest brother, Thupten Jigme Norbu, had been recognised at the age of eight as the reincarnation of the high Lama Taktser Rinpoche and his sister, Jetsun Pema, spent most of her adult life on the Tibetan Childrens Villages project. The Dalai Lamas first language was, in his own words, a broken Xining language which was the Chinese language, a form of Central Plains Mandarin, and his family did not speak the Tibetan language. Sir Basil Gould, British delegate to Lhasa in 1936, related his account of the team to Sir Charles Bell, former British resident in Lhasa. 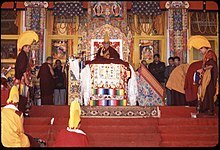 The Regent, Reting Rinpoche, shortly afterwards had a vision at the lake of Lhamo La-tso indicating Amdo as the region to search. This vision indicated a large monastery with a roof and turquoise tiles. This team, led by Kewtsang Rinpoche, went first to meet the Panchen Lama, the Panchen Lama had been investigating births of unusual children in the area ever since the death of the 13th. He gave Kewtsang the names of three boys whom he had discovered and identified as candidates, within a year the Panchen Lama had died. There they found a house, as described in the vision, according to the 14th Dalai Lama, at the time the village of Taktser stood right on the real border between the region of Amdo and China. 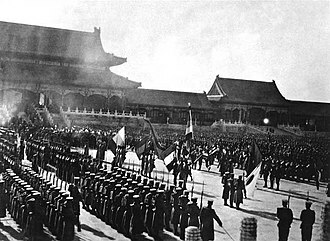 Tibet under Qing rule refers to the Qing dynastys rule over Tibet from 1720 to 1912. 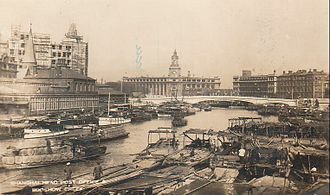 During the Qing rule of Tibet, the region was structurally and administratively controlled by the Qing dynasty established by the Manchus in China, the Chinese began to take steps to reassert their authority shortly after the British expedition to Tibet. Güshi Khan of the Khoshut in 1641 overthrew the prince of Tsang and made the 5th Dalai Lama the highest spiritual and political authority in Tibet, the time of the 5th Dalai Lama was a period of rich cultural development. He acted as a mediator between Mongol tribes, and between the Mongols and the Qing Kangxi Emperor, the Dalai Lama would assign territories to Mongol tribes, and these decisions were routinely confirmed by the Emperor. In 1674, the Emperor asked the Dalai Lama to send Mongolian troops to suppress a rebellion in Yunnan. The Dalai Lama agreed to do so, but advised Kangxi to resolve the conflict in Yunnan by allotting fiefs instead of military action. 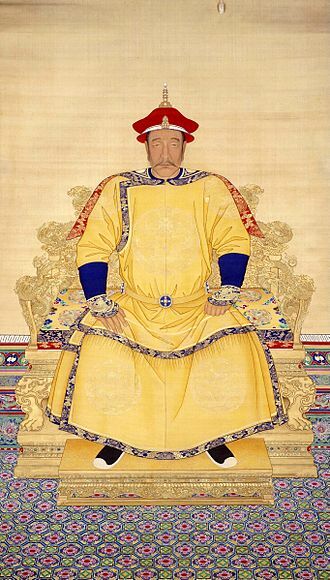 This was apparently a turning point for the Emperor, who began to take action to deal with the Mongols directly, the 5th Dalai Lama died in 1682. His regent, Desi Sangye Gyatso, concealed the death and continued to act in his name, in 1688, Galdan Boshugtu Khan of the Khoshut defeated the Khalkha Mongols and went on to battle Qing forces. 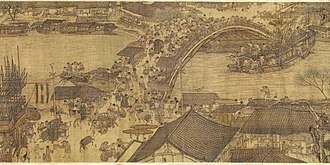 This contributed to the loss of Tibets role as mediator between the Mongols and the Emperor, several Khalkha tribes formally submitted directly to Kangxi. When Sangye Gyatso complained to Kangxi that he could not control the Mongols of Kokonor in 1693, Kangxi annexed Kokonor, giving it the name it bears today and he annexed Tachienlu in eastern Kham at this time. 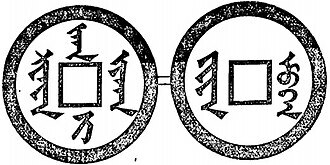 When Kangxi finally destroyed Galdan in 1696, a Qing ruse involving the name of the Dalai Lama was involved, about this time, some Dzungars informed the Kangxi Emperor that the 5th Dalai Lama had long since died. He sent envoys to Lhasa to inquire and this prompted Sangye Gyatso to make Tsangyang Gyatso the 6th Dalai Lama public. Padmasambhava, known as Guru Rinpoche, was an 8th-century Indian Buddhist master. A number of legends have grown around Padmasambhavas life and deeds, and he is venerated as a second Buddha across Tibet, Bhutan. 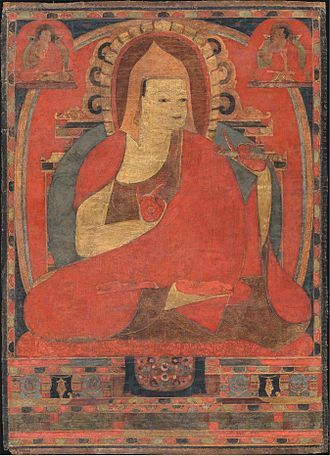 The Nyingma school considers Padmasambhava to be a founder of their tradition, nyangrel Nyima Özer was the principal architect of the Padmasambhava mythos according to Janet Gyatso. Guru Chöwang was the major contributor to the mythos. In the eleventh and twelfth centuries there were several competing terma traditions surrounding Padmasambhava, Songtsän Gampo, and Vairotsana. At the end of the 12th century, there was the victory of the Padmasambhava cult, according to tradition, Padmasambhava was incarnated as an eight-year-old child appearing in a lotus blossom floating in Lake Dhanakosha, in the kingdom of Oddiyana. Padmasambhavas special nature was recognized by the local king of Oḍḍiyāna and was chosen to take over the kingdom. In Rewalsar, known as Tso Pema in Tibetan, he secretly taught tantric teachings to princess Mandarava, the king found out and tried to burn him, but it is believed that when the smoke cleared he just sat there, still alive and in meditation. Greatly astonished by this miracle, the king offered Padmasambhava both his kingdom and Mandarava, Padmasambhava left with Mandarava, and took to Maratika Cave in Nepal to practice secret tantric consort rituals. 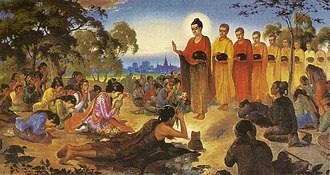 They had a vision of buddha Amitāyus and achieved what is called the rainbow body. Both Padmasambhava and one of his consorts, are believed to be alive and active in this rainbow body form by their followers. She and Padmasambhavas other main consort, Yeshe Tsogyal, who hid his numerous termas in Tibet for discovery. Many thangkas and paintings show Padmasambhava in between them, with Mandarava on his right and Yeshe Tsogyal on his left. 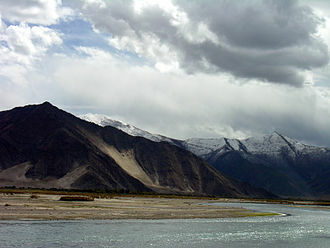 According to this story, King Trisong Detsen, the 38th king of the Yarlung dynasty. 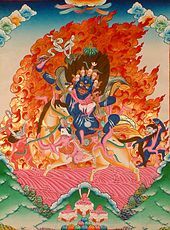 Śāntarakṣita started the building of Samye, demonical forces hindered the introduction of the Buddhist dharma, and Padmasambhava was invited to Tibet to subdue the demonic forces. The demons were not annihilated, but were obliged to submit to the dharma and this was in accordance with the tantric principle of not eliminating negative forces but redirecting them to fuel the journey toward spiritual awakening. Tibetan history, as it has been recorded, is particularly focused on the history of Buddhism in Tibet. This is partly due to the role this religion has played in the development of Tibetan and Mongol cultures. 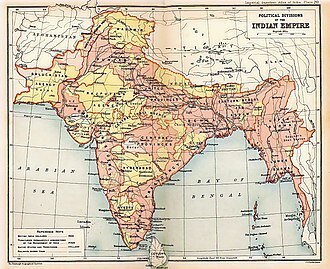 Tibet lies between the areas of the ancient civilizations of China and of India. Extensive mountain ranges to the east of the Tibetan Plateau mark the border with China, Tibet is nicknamed the roof of the world or the land of snows. 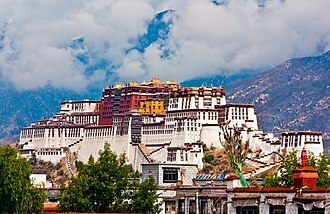 Linguists classify the Tibetan language and its dialects as belonging to the Tibeto-Burman languages, some archaeological data suggests archaic humans may have passed through Tibet at the time India was first inhabited, half a million years ago. 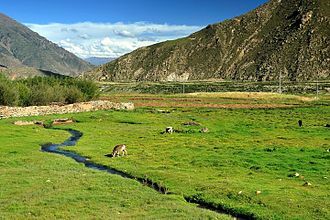 Modern humans first inhabited the Tibetan Plateau at least twenty-one thousand years ago and this population was largely replaced around 3,000 BC by Neolithic immigrants from northern China. 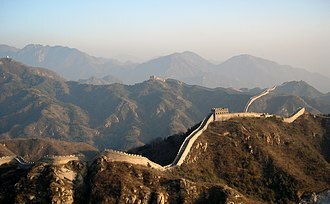 However, there is a partial genetic continuity between the Paleolithic inhabitants and the contemporary Tibetan populations, megalithic monuments dot the Tibetan Plateau and may have been used in ancestor worship. 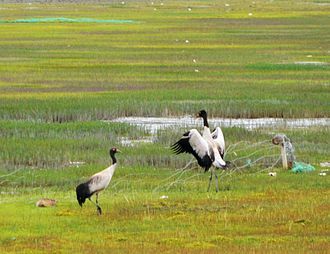 Prehistoric Iron Age hill forts and burial complexes have recently found on the Tibetan Plateau. According to Namkhai Norbu some Tibetan historical texts identify the Zhang Zhung culture as a people who migrated from the Amdo region into what is now the region of Guge in western Tibet, Zhang Zhung is considered to be the original home of the Bön religion. He was assassinated and Zhang Zhung continued its dominance of the region until it was annexed by Songtsen Gampo in the 7th century. In A. D.108, the Kiang or Tibetans, liang Kin, at the price of some fierce fighting, held them off. 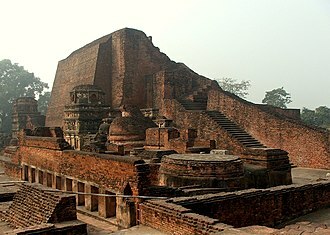 Similar incursions were repelled in A. D. 168-169 by the Chinese general Tuan Kung, the dates attributed to the first Tibetan king, Nyatri Tsenpo, vary. 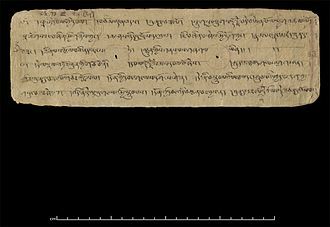 Some Tibetan texts give 126 BC, others 414 BC, Nyatri Tsenpo is said to have descended from a one-footed creature called the Theurang, having webbed fingers and a tongue so large it could cover his face. Due to his appearance he was feared in his native Puwo. There he was greeted as a fearsome being, and he became king, the Tibetan kings were said to remain connected to the heavens via a dmu cord so that rather than dying, they ascended directly to heaven, when their sons achieved their majority. Prayer Wheels at 'Tsuglagkhang Temple', McLeod Ganj. Tibet within the Qing dynasty in 1820.